HAYR, ANNIE LINDA (Jack), teacher, author, horticulturist, and horticultural columnist; b. 1 Jan. 1839 in Northamptonshire, England, daughter of John Hayr; m. 13 June 1860 Robert Jack (d. 1900), probably in Saint-Rémi, Lower Canada, and they had 12 children, 11 of whom survived to adulthood; d. 15 Feb. 1912 in Châteauguay Basin (Châteauguay), Que. Annie Linda Hayr immigrated to the United States in 1852 and she received an excellent education at the Troy Female Seminary in Troy, N.Y. Her interest in writing soon became evident; one of her school compositions was published in the Troy Daily Times. The school’s better students often acted as assistant teachers while completing their studies; by age 16 Hayr was first assistant in the free schools of Troy. Hayr became a schoolteacher in Châteauguay, Lower Canada, a few miles south of Montreal, where she met her husband, Scottish-born Robert Jack. After their marriage, they settled at Hillside, his 240-acre farm at Chateauguay Basin. Realizing that farmers’ wives had little independent income, she asked for one acre to devote to the horticulture of her choice; the profits would become her pocket money. The results of this venture would be described almost 20 years later in the Rural New Yorker (New York), a periodical in which she published regularly. Under her influence, numerous fruit-bearing trees, bushes, and vines were planted around Hillside and a greenhouse erected. From 1877 to 1890 she was a regular contributor to the Reports of the Montreal Horticultural Society and Fruit Growers’ Association of the Province of Quebec, as well as a prizewinner at its exhibitions. Her clearly written articles were based on her wide reading and her correspondence with other horticulturists, but especially on her own observations and on extensive experiments. 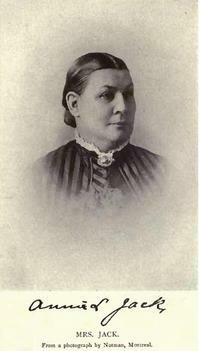 She and her husband gained reputations as industrious and prosperous fruit growers and market gardeners. For example, in 1876 they added over 1,000 apple trees to their orchard; a few years later they shipped apples to England. By the 1890s they would also be selling a variety of fruit trees, shrubs, and plants. Children arrived in rapid succession, but Jack found time to continue writing. Two poems appeared in the Montreal Daily Witness in 1873–74; one alluded to the death of a young child. Jack taught her children at home and thus sought to keep abreast of scientific discoveries. During the 1870s and 1880s she corresponded with geologist John William Dawson*, principal of McGill College, to find mentors for her sons and to seek access to museums and scientific lectures for herself. (Her son John George became a noted American dendrologist.) She also offered her ideas on scientific and rural education. She keenly felt her lack of intellectual contacts in Canada. At one point she explained that she had received more encouragement for her work from Boston than from Montreal, and added significantly, “Canada is my adopted, and my children’s native country, and I wish to give and receive from it more than at present.” Her membership in the Montreal Ladies’ Educational Association in 1882–83 may have been one attempt to break her isolation. Sometime in the 1880s or early 1890s Jack wrote a popular series of articles on social topics for the Montreal Witness under the pen-name Loyal Janet. Articles by her appeared regularly in the Waverley Magazine (Boston) and she apparently published numerous short stories and poems in American magazines for adults, such as Good Cheer (Greenfield, Mass. ), as well as in Wide Awake (Boston) and other periodicals for children. One article on the new fields of work available to women attracted the attention of Harper’s Young People (New York), which commissioned a similar article. By 1895 her reputation was well established; she was made an honorary member of the Montreal Women’s Club. American women (1897) called her home one of the “landmarks of the Dominion,” describing it as a haven of comfort, refinement, art, music, flowers, and education. From 30 April 1898 to at least 1903 Jack wrote a lengthy weekly column in the Montreal Daily Witness. “Garden talks,” as it came to be called, usually opened with a paragraph on a social or moral topic, discussed various aspects of gardening, and answered readers’ questions. Meanwhile, she continued to write for specialized periodicals, contributing to the Canadian Horticultural Magazine from 1897 to 1899 and to the Canadian Horticulturist from 1901 to 1911. In 1903 she published her only full-length work on horticulture, The Canadian garden; a second edition would appear in 1910. An important work in the history of gardening, it was one of the few Canadian books available at the time and, according to historian Edwinna von Baeyer, it “influenced gardeners all over eastern Canada.” Canadian garden combined helpful advice with almost lyrical passages and reflected the author’s belief in the morally uplifting values of gardening as well as the practical ones. Renowned American horticulturist Liberty Hyde Bailey described her garden, which attracted numerous visitors, as one of the most original in North America and in 1915 he included a biography of her by Linus Woolverton in his Standard cyclopedia of horticulture. Although less known, Jack’s other literary productions were significant. In 1902 she had published The little organist of St. Jerome, a collection of short stories which had already appeared elsewhere. Set mainly in rural Quebec and full of local colour, including attempts at French Canadian dialect, the stories were for the most part romantic ones with moral overtones. In 1904 she brought out Rhyme-thoughts for a Canadian year, a small book of poetry. By the time of her death at age 73 Annie Linda Jack, mother, homemaker, author, and horticulturist, had certainly achieved her goal of contributing to her adopted country. [The author would like to acknowledge the gracious assistance of Pleasance Crawford of Toronto, Carole Gerson of Burnaby, B.C., and Catherine Swann of Châteauguay, Que. ACC, Diocese of Montreal Arch., Saint-Rémi Protestant Episcopal Church (Saint-Rémi, Que. ), RBMB, 13 June 1860. ANQ-M, CE6-52, 1860–64; CE6-53, 1866–80. McGill Univ. Arch. (Montreal), MG 1022 (J. W. Dawson papers). NA, RG 31, C1, 1861, 1871, 1881, 1891, Châteauguay. Gazette (Montreal), 17 Feb. 1912. Montreal Daily Star, 16 Feb. 1912. Montreal Daily Witness, 1869–1903. American women . . . , ed. F. E. Willard and M. A. [Rice] Livermore (rev. ed., 2v., New York, 1897; repr. Detroit, 1973). L. H. Bailey, “Originality in gardens,” Garden Magazine (New York), 1 (1905), no.1: 17. Canadian Farm (Toronto), 1 March 1912: 9; 8 March 1912: 9. Ann Leighton, American gardens of the nineteenth century (Amherst, Mass., 1987). Literary history of Canada: literature in English, ed. C. F. Klinck et al. (2nd ed., 4v., Toronto, 1976–90), 1: 302–3. Montreal Ladies’ Educational Assoc., Report, 1882/83. Montreal Women’s Club, Report, 1900/1. Standard cyclopedia of horticulture . . . , ed. L. H. Bailey (6v., New York, 1914–17), 3: 1581. Types of Canadian women . . . , ed. H. J. Morgan (Toronto, 1903). Edwinna von Baeyer, Rhetoric and roses: a history of Canadian gardening, 1900–1930 (Markham, Ont., 1984). Paulette M. Chiasson, “HAYR, ANNIE LINDA,” in Dictionary of Canadian Biography, vol. 14, University of Toronto/Université Laval, 2003–, accessed April 24, 2019, http://www.biographi.ca/en/bio/hayr_annie_linda_14E.html.